Tagline- The Fear, the Terror, the Nightmare, They Will Never Forget It! 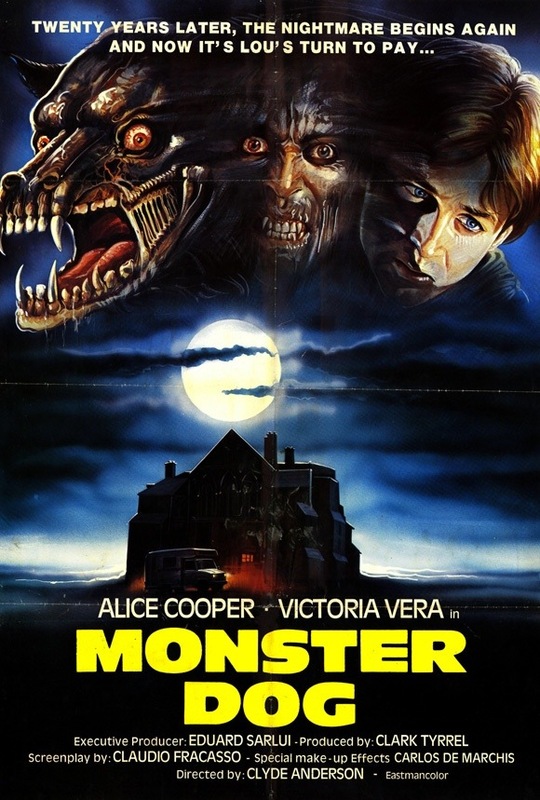 Released in 1984 starring rock legend Alice Cooper, Monster Dog was written and directed by Clyde Anderson also known as Claudio Fragasso and while it may be a different name, but its the same result. This was yet another turkey made by Fragasso and while I fully get his appeal on the so bad its good level I just find his films so bad they’re bad. Monster Dog does nothing to change my mind in his work, but from a production side of things this might be his best film as the production values are better than the bulk of his work. But while production values might be better the quality of the film is no better than his other movies. Vincent Raven (Cooper) is a rock star returning to his childhood home to shoot a music video; the place Vincent is returning to is the site of a bunch of murders by dogs led by a monster dog, which is a werewolf. Secrets from the past come to surface as the dogs begin to maul people. The script by Fragasso is the typical script by him; its idiotic with poor characters no sense of plot and idiotic dialogue. Fragasso in all his years never seemed to figure anything out as a writer or director for that matter and while this isn’t his worst script and if anything its one of his stronger ones, which isn’t saying much since the script is a complete mess with some decent ideas, but with a hack writer you get what you pay for. As poor as the script was the direction by Fragasso is even worse. With Monster Dog, Fragasso attempts at creating an eerie tone with a film based on suspense and not much of a shocker, but its a complete failure every step of the way as the film is poorly paced and despite running at only 84-minutes it feels like 500-minutes. Even in some of Fragasso’s past work as poor as the films were at least they weren’t boring, well for the most part. They were bad films and while some found them so bad their good I just found them bad, but again at least in general they weren’t boring, but with Monster Dog, Fragasso delivers a boring sloppy paced movie. The gore is light and the action scenes are forgettable in general. I actually liked what Claudio Fragasso was attempting with Monster Dog and with a director with a clue this could have turned out decent, but Fragasso isn’t a good filmmaker and all he creates is a boring film with action scenes few and far between and even when there is action it’s so poorly staged. As most fans of Italian cinema know more often than not these films are dubbed even if the cast is English speaking since these films are normally shot with no sound and its all added in later and Alice Cooper didn’t do his own dubbing, which is kind of annoying since we see his mouth moving, but not his voice. Cooper also lends his music talents to the soundtrack and no question Alice Cooper is one of the rock greats, but the songs used come across as B-side singles, but they were still decent tracks. Overall Monster Dog is in typical Fragasso fashion a mess of a film; I was quite bored through most of the film and the F/X are quite poor and the Monster Dog is hysterical. If you’re one of those that can find the fun in Fragasso’s work you might dig this, but for those like me that dislike him this turkey is a skipper.